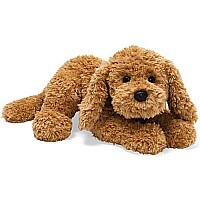 Everybody loves Muttsy - a classic dog from GUND. With the cutest face, longest ears and softest fur, who can resist hugging this adorable puppy! Available in 3 sizes. Muttsy is 27 years old, (in dog years 189)! $19.99 Zi-Bo - Panda Large 17"
$24.99 Zi-Bo - Panda Small 12"
$14.99 Philbin - Beige 12"